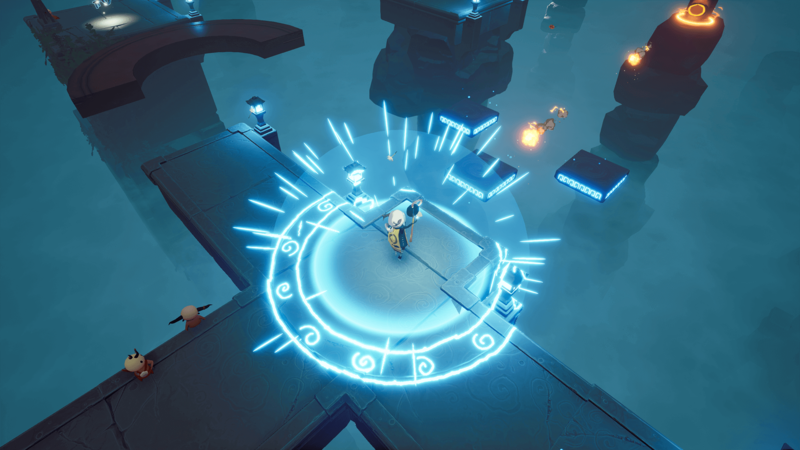 Elli takes on the Zelda stylings through colorful environments, full of lush plant life, and various bits of runes and the like, to create its own unique tale. However, Elli also utilizes most of the recently stapled 3D platforming tropes and begins to fall into a pattern of repetition because of it. You begin the game making your way to Elli’s birthday party, filled with cake and mandragoras, because of course. These little imps are wishing you a happy six-hundredth birthday. Just as you are about to partake in the festivities, another girl named Ghasti — who hopes to become a Guardian using their power — breaks a structure outside holding the Crystals of Time within it, steals them to her bag and takes off. Being the sole Guardian of said crystals, you take chase, hoping to regain the time crystals before it’s too late. Gameplay in Elli falls into a pattern of locating a door and working with boxes, switches, portals and magical colored powers in order to open them. Lots of platforming takes place within these interactions as well, and while there are many bouts of random fire being spewed from statues and whatnot, there are thankfully no real enemies to speak of. While definitely used to help support your six-hundred year old body, your staff also doubles as a magical tool that can uncover hidden platforms and smash pots to reveal the gems within — a collectible currency you can later exchange for cosmetic upgrades such as hats and different robes. You will find yourself falling a lot in this game due to the fixed camera angle, which often disturbs your ability to discern depth properly. It’s certainly something you can get used to, but it makes otherwise simplistic platforming unnecessarily challenging. That would typically make a game overall a trudge to bear, but thankfully Elli’s colorful graphics keep the game lively. Every environment shines with a vibrant palette — similar to a classic Nintendo game — and has a lot of props and objects that help fill out otherwise empty space. The music is also fitting for each level but can sometimes be a bit much, repeating after relatively short loops with odd instruments that makes finishing the current puzzle that much more important. Some of my favorite parts of the game use color coins scattered around the level in order to establish musical patterns — think the electronic copycat game Simon — within a four-colored crest inset in the ground. Each pattern represents a flower-like pedestal within the level, which can be used to access otherwise inaccessible areas. It’s a neat puzzle mechanic and breaks up the other standard puzzle platforming fare — seeing color magic used in a game is pretty neat too, as it’s not that commonly seen in games. Once you’ve caught up to Ghasti, instead of entering some epic boss fight, you begin a side-scrolling sequence of outrunning a closing portal, trying to make it to the goal before it catches up to you. You are also given the ability to double-jump and midair dash — something you can’t do in the rest of the game, but certainly would have it made the sometimes absurd platforming challenges a bit easier. Once you make it through the challenge, you recover one of the Crystals of Time and as expected, Ghasti runs away again. It’s a unique take on a boss fight, but I feel a more traditional, puzzle-based battle would have been more appropriate. This pattern continues through the varied environments, but each one follows its own theme, from outdoorsy marble structures covered in foliage to a dim-lit dungeon. Each area has its own environmental hazards, but without a true combat system with enemies, you find it seeming like you’ve done it all before — just in a different area. I guess overall that’s what is expected from games in this genre, I personally was hoping for a bit more from a game that cherishes the magic all around you. Even with Elli’s flaws, it’s certainly an enjoyable title. 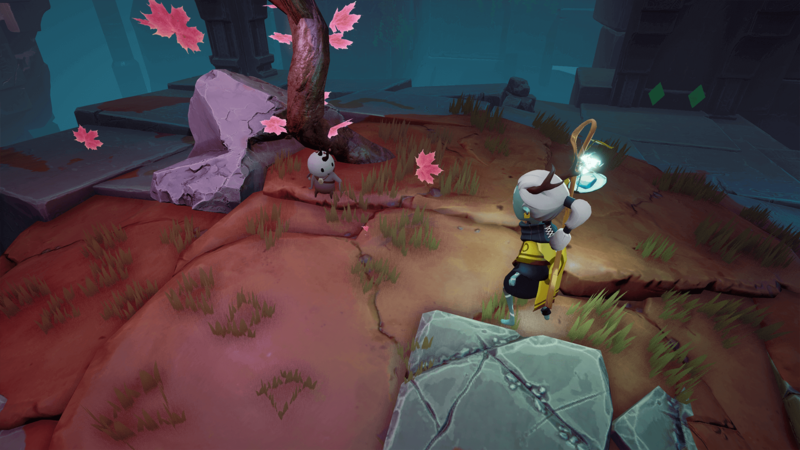 Someone looking for a portable romp in the stylings of RiME or Zelda, that have already beaten those games, could get lost playing in Elli’s magical, colorful world and fall in love with its charming, whimsical characters the same as I did. Elli is available now for the Nintendo Switch. Check out their website or Twitter for more information.